A few decades ago, marketing and advertising meant putting up billboards and buying radio or TV placement ads. A company’s marketing budget was dedicated to producing these awesome posters, pamphlets, and jingles. Fast-forward a couple of years and a lot – if not all – has changed. Now, this marketing budget, regardless of size, should be focused on social, search, email and mobile. The statistics are proof of this shift in marketing budget: for nearly half a decade, investments in traditional advertising have consistently dropped by single digit percentages each year. Digital marketing spending, by comparison, has consistently grown by double-digit increments year after year. So, how much should small businesses spend on digital marketing in 2017? This article provides information that can guide you through setting up your marketing budget and where to invest those marketing dollars. Email, Social, Display Ads, Mobile and Search are all growing in 2017. Digital is now at $75,000 a year, or 35% of all marketing spend on average for companies. Companies are shifting more and more money to digital because of it’s perceived R.O.I., and the ability to spend less for more return. “Digital marketing is vital for SMBs and our survey numbers bear that out,” said Simon Grabowski, GetResponse CEO and Founder. “Marketers are investing accordingly, given the substantial return on investment delivered through web-based campaigns.” According to GetResponse, 70% of small to medium-sized businesses said they will increase their digital/web-based marketing budgets this year. Furthermore, SMB marketing statistics available from 2016 indicate that 62% of small businesses are investing 4% or more of their revenue in marketing. SMBs spend on average 46% of their marketing budget on digital marketing. 78% of SMBs think that mobile marketing is an important channel for their business. 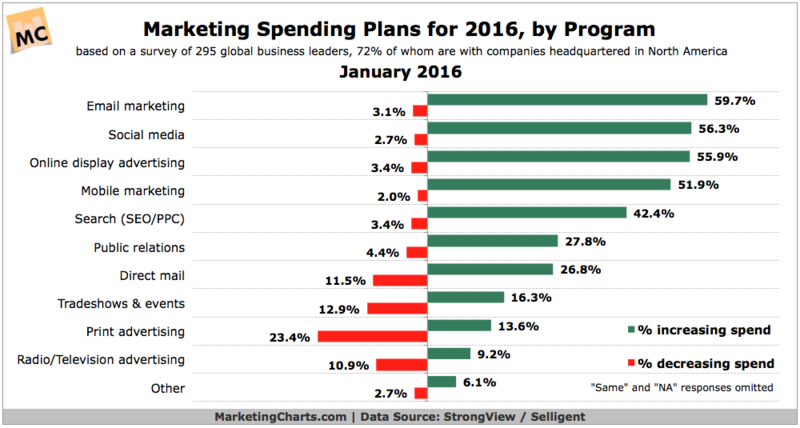 According to GetResponse, social, mobile and email are at the forefront of digital marketing spending this year. More specifically, 59% of SMBs said marketing on social networks, such as Facebook, LinkedIn and Twitter will be the primary spending focus. The next channel projected to drive digital marketing spend in 2017 is mobile marketing (50%) — either app or web-based — followed by email marketing (42%). The other important digital channels include, video production, search marketing, content creation, data analysis and website maintenance. A report from Forrester Research, on the other hand, estimates that search engine marketing will capture the largest share of online spend. Overall, the chart below from 2016 shows strong increases in digital channel investment. Of the five digital marketing strategies represented, each expected to see at least a 42% increase in investment. Source: How Much Should Small Businesses Spend on Digital Marketing in 2017?